The Tigers made a bold move this off-season when they responded to Victor Martinez’s unfortunate season-ending knee injury by acquiring slugger Prince Fielder. Fielder is fresh off one of his finest seasons with 38 home runs and 120 RBI while batting .299 for the Brewers. The main complaint on Fielder is that his sheer size will eventually lead to some injuries, however, the same was once said of Miguel Cabrera when the Tigers acquired that star from the Marlins. While Cabrera has had some issues off the field, he is also one of the most consistent and dependable sluggers in baseball over the last five seasons. Similarly, Fielder ranks third in plate appearances since 2006 only trailing Ichiro and Derek Jeter. Another statistic that should provide some confidence for Tigers fans is the fact that Fielder decreased his strikeout rate and total significantly last season. While Ryan Howard has been a minor disappointment with the Phillies since signing a major contract due to his free-swinging ways, Fielder is more of a contact hitter, which can keep innings and rallys alive. Desperate for some offense, the Twins signed Josh Willingham during the off-season. The move seems to make some sense as Willingham is fresh off a career-high 29 home runs and 98 RBI and should help replace Michael Cuddyer in the lineup. The problem is that Willingham also saw his average and OBP take a hit last season from .268 to .246 and from .389 to .332. These numbers are actually lower than Cuddyer posted last season. The hope for the Twins is that Willingham posted respectable numbers despite the pitcher-friendly Oakland Coliseum and the A’s lineup generated very little protection, suggesting that he should surpass those figures this season. There is a problem with that logic, as Willingham actually performed better at home than on the road and the Twins Target Field is also a pitcher’s haven with a Twins offense that offered little production last season. No question about it the Twins acquisition of Willingham carries some risk. We will soon find out if Willingham is a one-trick pony that specializes in power or if he can return to his previous year’s level of reaching base more consistently. The Milwaukee Brewers are reeling right now as Prince Fielder left for the Detroit Tigers and MVP winner Ryan Braun may miss 50 games of the season with a suspension for using a performance-enhancing substance. The lone piece of good news is that the team did acquire Aramis Ramirez over the off-season, which will offer some stability at the hot corner. In effect, Ramirez will have to replace Fielder as the slugger in the Brewers lineup. The main issue for Ramirez over the years has been his inability to stay healthy. In fact, Ramirez has managed to play 150 games just twice in his 14-year career. Last year Ramirez was healthy and the result was 26 home runs, 93 RBI, and a .306 average. Ramirez is a solid all-around hitter who often puts the ball in play while also drawing a healthy dose of walks. The one statistic that showed Ramirez to return to form last season was his ability to hit the fastball. After hitting just .236 off the heater last season, Ramirez belted 13 home runs with a .302 average this season. Ramirez should once again offer a solid bat with some power this season… assuming he can stay healthy. Josh Willingham will be 32 next season and in his final year of arbitration, but the Oakland Athletics saw enough there to trade two fringe prospects for him on Thursday. Perhaps they liked his consistency at the plate. For the last four years, the Hammer’s full-year statistics in some key categories have not wavered much. Check out his walk rate – it has gone from a ‘low’ four years ago at 10.9% to a high of 14.9% last year. His strikeout rate has stayed in a tight range, 23% to 24.3%, and his isolated slugging percentage has been between .192 and .237 over the past four years. The overall package is one that doesn’t wow anyone from a fantasy perspective (he’s never hit more than 26 home runs or better than .277). But Willingham works well as a late-round mixed league outfielder or a stable deep-league bat. He’s predictable. How will he fare in his new digs? His FanGraphs splits show that he’s a pull hitter – he has a .810 career slugging percentage to left field (compared to .320 to right field). The Nationals’ park was 337 feet to left field and 377 feet to left-center, so it counts as good news that the Oakland Coliseum is 330 feet to left and 367 to left-center. However, dimensions aren’t everything – the Nationals’ park had a 100 park factor for home runs by a righty last year, and the Coliseum a 77 in that category (ESPN’s three-year park factor for all batters was .872). Whether it’s the weather or some other factor, it was definitely difficult for righties to hit it out of the Coliseum last year. So it’s not likely that Willingham will set a career high in home runs at his age and in that ballpark. In return for Willingham, the Nationals will receive two prospects who were not among Baseball America’s top 10 for the Athletics. Right-handed reliever O’ Henry Rodriguez throws gas (98.8 MPH on the fastball, career) and can strike batters out (more than a strikeout per inning every stop). But he’s also had some trouble with control (4.26 BB/9 IP in his short MLB career, 6.6 BB/9 IP in the minor leagues). If his high but manageable major league walk rate holds, he could be a force at the back of a pen. Drew Storen will likely get most of the save chances for the Nats to begin the season, though. Minor league outfielder Corey Brown projects as a fourth outfielder and injury fill-in, though with some potential to eke out a starting corner outfield job at some point. As a three-year college hitter, his numbers need to be taken with a grain of salt, but he’s done well at Double-A in a mostly-neutral run environment for two years now (.269/.348/.488 and .320/.415/.502 in 2009 and 2010 in the Texas league, respectively). He walks (11.3% career), has power (.225 career ISO), and speed (48 stolen bases against only eight caught stealing). The problem is that he doesn’t make great contact (31%), so don’t bet on a good batting average. He’s improved that number recently (it’s hovered around 28% the last two years), but the major leagues will boost those strikeouts and keep Brown from being a mixed-league option, at least for now. With Willingham’s muted upside, Rodriguez’s control issues, and Brown’s strikeouts, each player has a flaw that makes for a tough draft decision. Pick up Willingham late in standard mixed leagues; take a wait-and-see approach on Rodriguez and Brown. 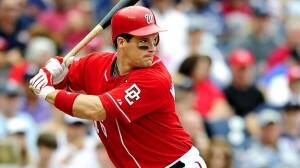 Josh Willingham Laying Down The Hammer in D.C. When the Nationals acquired Josh Willingham and Scott Olsen from the Marlins in exchange for Emilio Bonifacio and a pair of minor leaguers before the 2009 season, it was Olsen who was thought of as the key player in the deal. After all, he was a 24 year-old left-handed starter who had made at least 30 starts in each of the previous three years without a trip to the disabled list. Willingham was a throw-in perhaps, a soon-to-be 30 year-old serviceable outfielder with some okay offensive numbers. Marlins President of Baseball Operations, Larry Beinfest admitted money was one of the reasons the deal was made as both players were entering their first year of arbitration. Things turned out a little differently. Although he escaped the DL in Florida, Olsen has been bit by the injury bug in Washington. He has made just 19 starts since the trade – tossing 105.2 innings with a 4-6 record in two seasons. 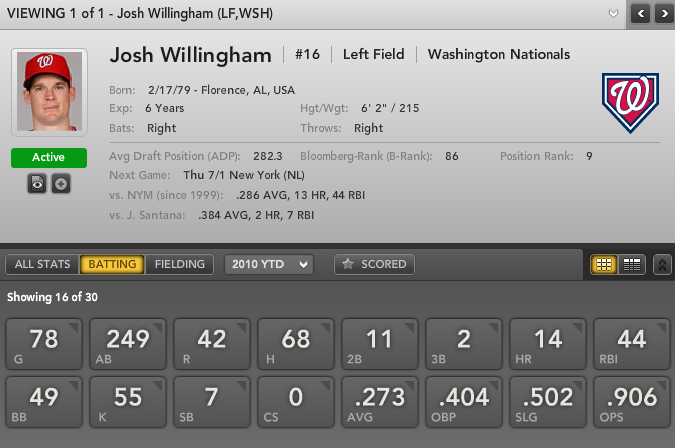 On the other hand, Willingham has become one of the best offensive players in the National League no one is talking about. After posting a more than respectable slash line (AVG/OBP/SLG) of .260/.367/.496 with 24 home runs, 61 RBI and 70 runs scored in 2009, Willingham is turning in his best work in 2010. The former catcher is hitting a modest .273; however, he is slugging .502, and is getting on-base at a .405 clip. Both would be career highs for a full-season. Whenever a player has a breakout season beyond the age of 30, some will assume it is a fluke or an outlier. In a lot of cases this is true. 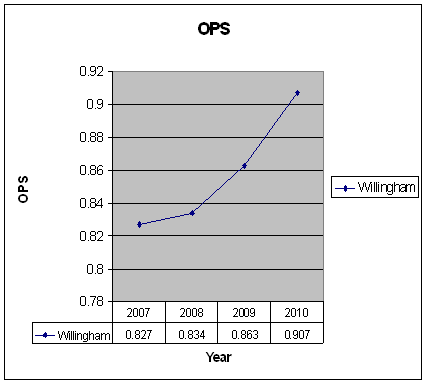 That said, Willingham is on a steady four-year OPS incline suggesting that he maybe nearing – or right at – his career peak. If you are looking for fluke stats – good luck. His batting average on balls in play (BABIP) of .295 is lower than his career .299 number. His ISO (Isolated Power), which indicates raw power by taking slugging percentage and subtracting batting average, is .229, or within 15 points of his career .215 average. The biggest change for Willingham in 2010 is better plate discipline. He is walking 15.8% of the time (up from 11.5% career), and is striking out slightly less (22.1% in 2010, 23.1% career). Despite the .907 OPS and a .403 weighted on-base average (wOBA), an advanced metric that measures multiple offensive numbers and is scaled to mirror OBP, “The Hammer” is only owned in 55% of leagues according to hotboxsports.com. Because of his age and contract status (one more year of arbitration), Willingham could be a trade candidate in both leagues should the Nationals choose to sell. That would make him a slight risk in NL-Only formats. Nevertheless, there is no reason to wait on grabbing him off of waivers – if you’re lucky enough – or through a trade in mixed leagues right now.